Virbhadra Singh (born 23 June 1934), is an Indian politician. The longest-serving and 4th Chief Minister of Himachal Pradesh, he served as the Chief Minister from 2012 to 2017 before being replaced by BJP's Jai Ram Thakur in December 2017. He previously served as Chief Minister from 1983 to 1990, from 1993 to 1998 and from 2003 to 2007. He was an elected member of the Lok Sabha in 1962, 1967, 1972, 1980 and in 2009. He is a member of the Indian National Congress. His wife, Pratibha Singh, was a Lok Sabha member from Mandi. 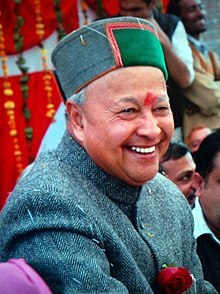 Virbhadra Singh was born on 23 June 1934 at Sarahan, Shimla district. Singh was educated at Bishop Cotton School (Shimla) and later obtained a BA Honours degree from St. Stephen's College, Delhi. He is married to Pratibha Singh and has a son and four daughters including Abhilasha Kumari. Singh gained a seat in the Lok Sabha — which is the lower house of the Parliament of India — in the Indian general elections of 1962. He repeated that success in the elections of 1967 and 1971. He was again elected to the Lok Sabha in 1980 and a further election to that house came in 2009, following an absence from the intervening two Lok Sabhas. His wife had served a term following her victory in the 2004 elections. He was a member of the Indian Delegation to the General Assembly of the United Nations in 1976. Between 1976 and 1977, Singh held the national office of Deputy Minister for Tourism and Civil Aviation in central cabinet. He was Minister of State for Industries between 1980 and 1983. From May 2009 until January 2011, he held the cabinet post of Minister for Steel. He then became cabinet minister with responsibility for Micro, Small and Medium Enterprises, until resigning from office in June 2012. Aside from his role in national politics, Singh has also been elected on seven occasions to the Himachal Pradesh Legislative Assembly. The first occasion was in a by-election in October 1983, when he was returned for the Jubbal-Kotkhai constituency. He won that seat again in the 1985 elections. Thereafter, he was elected from the Rohru constituency in 1990, 1993, 1998 and 2003. Singh became the Chief Minister of Himachal Pradesh for the first time in April 1983 and held the post until March 1990. He was again appointed to the role between December 1993 and March 1998; and once more from March 2003. With reappointments within those years, this record amounted to him holding the office on five occasions. Between 1998 and 2003, Singh was Leader of the Opposition in the state Assembly. He was also president of the Himachal Pradesh Congress Committee from February 1992 to September 1994, and leader of the Congress Legislative Group. He was president of the State Congress Committee in 1977, 1979 and 1980. In July 2012, he quit all key party posts at a crucial time prior to the state elections of November 2012. It has been reported that the trigger for the resignations was his exclusion from the Screening Committee for short-listing of election candidates. Singh was appointed to lead the party on the eve of the November 2012 elections and did so with success. The party then agreed to him becoming Chief Minister of Himachal Pradesh for a record sixth time. His party lost majority in the 2017 elections and he tendered his resignation afterwards. Outside of politics, Singh has involvement with various social and cultural bodies. A consequence of these interests is that he has been president of the Sanskrit Sahitya Sammelan and of the Himachal Pradesh branch of the Friends of the Soviet Union. On 3 August 2009, a legal case was registered against Singh and his wife by the Anti-Corruption Bureau of Himachal Pradesh. The allegations were that they had breached the Prevention of Corruption Act in 1989, when Singh was Chief Minister of the state. The Bureau alleged that it had evidence in recorded conversations between the couple and various others concerning suspect financial transactions. The alleged recordings, which involved a now-dead officer of the Indian Administrative Service and several industrialists, dated from 2007 and were provided by a political opponent, Vijai Singh Mankotia. The couple were granted bail in December 2010 but in April 2011 the state government requested that this be rescinded due to allegations of witness tampering. This request followed attempts by two industrialists to remove themselves from the prosecution case, claiming that the evidence was forged and incorrect. The Singhs have attempted to have the matter taken out of police hands and passed to the Central Bureau of Investigation, as well as seeking a stay on further trial court proceedings. In January 2012, the Himachal Pradesh High Court had refused the latest of their petitions aimed at achieving the transfer and stay. The court ordered that the examination of potential charges and evidence by a trial court should go ahead. On 26 June 2012, Singh resigned from the Union Cabinet as a consequence of corruption charges being pressed against him. The couple were acquitted on the eve of Singh taking the role of Chief Minister in December 2012. In 2015 the Central Bureau of Investigation filed a case against Singh and his family for owning assets to the tune of Rs. 6.1 crore disproportionate to his known sources of income when he was the union minister between 2009 and 2011. Cases have been filed against his wife Pratibha Singh, son Vikramaditya and daughter Aparajita as well. On Saturday, 26 September, the Central Bureau of Investigations (CBI) raided 11 properties of Virbhadra Singh to probe the charges of accumulating disproportionate assets. A case had been filed by the agency one day before the raids. On 26 October 2015, the Indian Supreme Court turned down a CBI plea seeking stay against an earlier order issued by Himachal Pradesh High Court granting protection from arrest and other relief to him and his wife in a disproportionate assets case. The SC, however, issued a notice to Singh and his wife, seeking response from Singh on the two petitions filed by the CBI. ^ a b c d "Bio Data of Chief Minister". Archived from the original on 2012-12-30. Retrieved 27 December 2012. ^ a b c d e f g h "Detailed Profile: Shri Virbhadra Singh". Government of India. Archived from the original on 14 May 2011. Retrieved 5 January 2012. ^ "Biographical Sketch — Member of Parliament - 14th Lok Sabha". Parliament of India. Archived from the original on 30 October 2007. Retrieved 5 March 2012. ^ "Union minister Virbhadra Singh resigns from Cabinet following graft charges". The Times of India. TNN. 26 June 2012. Retrieved 26 June 2012. ^ "Virbhadra quits all party posts in a huff". 27 July 2012. Archived from the original on 27 July 2012. Retrieved 27 July 2012. ^ Sharma, Ashwani (20 December 2012). "HP polls 2012: Virbhadra Singh makes comeback with Congress win". Retrieved 25 December 2012. ^ "Virbhadra Singh sworn in as Himachal CM for a record 6th time". Indian Express. PTI. 25 December 2012. Retrieved 25 December 2012. ^ "Virbhadra Singh summoned by court". NDTV. PTI. 23 October 2010. Retrieved 5 March 2012. ^ a b "Himachal government seeks cancellation of Virbhadra's bail". IANS. 7 April 2011. Retrieved 5 March 2012. ^ Makhaik, Ravinder (10 January 2011). "Key witness in steel minister's CD case turns hostile". The Times of India. Retrieved 5 March 2012. ^ "Virbhadra CD Case : Witness moves court against prosecution". Thaindian.com. IANS. 4 April 2011. Retrieved 5 March 2012. ^ "Himachal CM-designate Virbhadra Singh acquitted in corruption case". The Times of India. TNN. 24 December 2012. Retrieved 24 December 2012. ^ "SC disallows CBI plea for stay on HP High Court order; seeks Virbhadra's reply". Daily Post. DP News and Agencies. 26 October 2015. Archived from the original on 19 December 2015. Retrieved 26 October 2015.